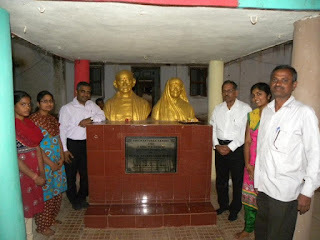 IDF team - Dr. AP Jayaraman, Dr. Narayan B Iyer, Mr. Sanjay Ram, Mr. Ramesh Kumar, Ms. Pragnya, Ms. Shweta - visited Kasturba Gandhi Bal Gurukul at Hyderabad on 28-02-2013. The students showed keen interest in science and got points clarified on career path. IDF congratulates all the students for wonderful academic excellence. IDF is committed to spread smiles all around. Dr. A.P. 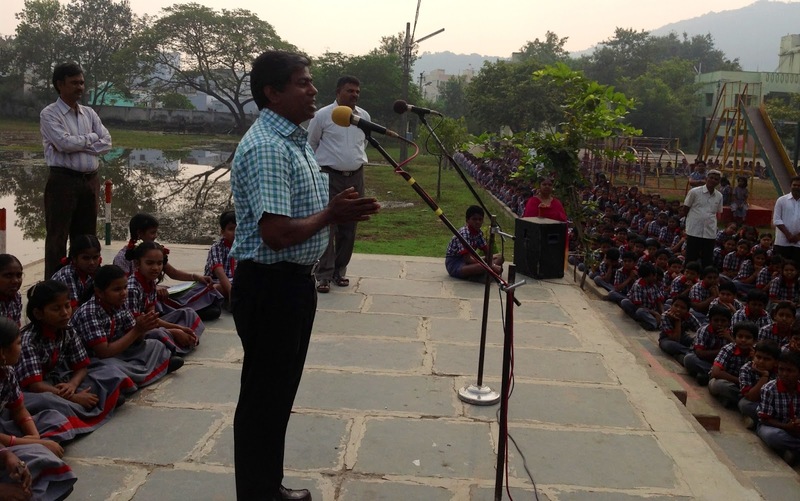 Jayaraman, Nuclear and Management Scientist and IDF Trustee spoke the students of Secunderabad Public School and MNR School in Hyderabad on the National Science Day. The session aimed at inculcatating scientific temper in young minds. 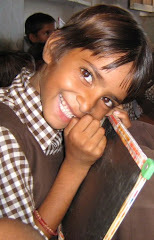 The students got a new approach for learning science and other subjects in a scientific manner. The events were organized as part of IDF's iDiscover Programme. IDF team - Dr. A.P. 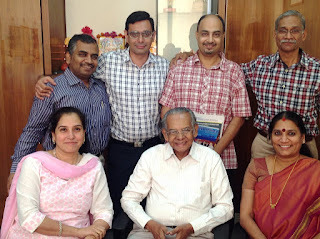 Jayaraman (Nuclear Scientist & Trustee, IDF), Dr. Narayan Iyer (CEO, IDF) and Mr. Sanjay Ram (Project Co-ordinator, IDF-AP) - visited IDF AIM for Seva Bal Gurukul at Hyderabad on 27-02-2013. The students showed keen interest to learn `thinking and creative skills'. The progress of the Gurukul was very much visible with the development of good communication skills and knowledge on current affairs. IDF team congratulated the students and wished them all the best. IDF- iDiscover, Dr. AP Jayaraman igniting young minds @ Bhavans Vidyashram and Bhavan's Sri Ramakrishna Vidyalaya, Andhra Pradesh. 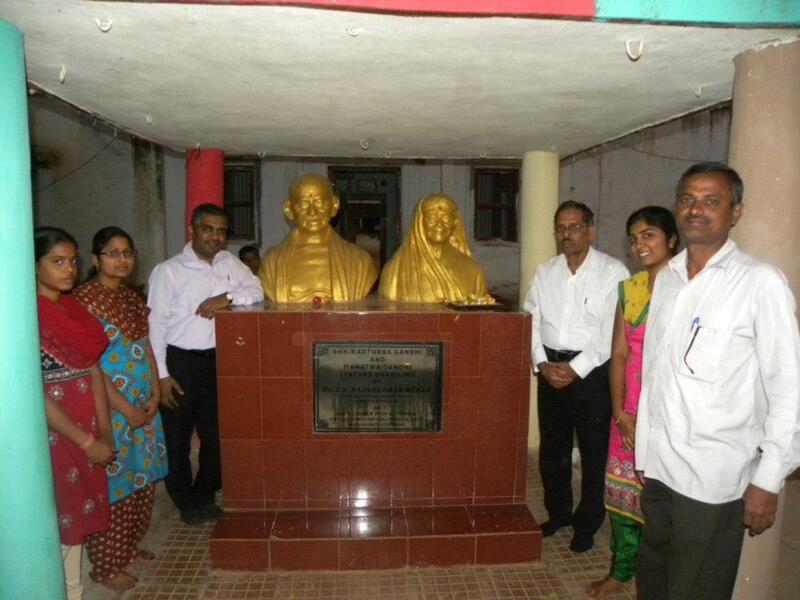 IDF iDiscover, Dr. A. P. Jayaraman @ Bhavan's Vidyashram & Bhavan's Sri Ramakrishna Vidyalaya, Andhra Pradesh. 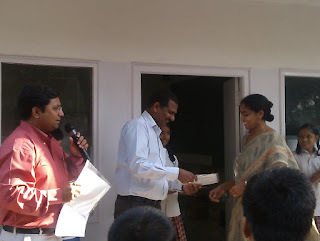 Dr. A. P. Jayaraman, Nuclear and Management Scientist and Trustee of IDF visited Bhavan's Vidyashram, NIRD Campus, Hyderabad and Bhavan's Sri Ramakrishna Vidyalaya, Sainikpuri, Secunderabad (Andhra Pradesh) on 27-02-2013 and ignited the young minds. Dr. Narayan B. Iyer, Mr. Sanjay Ram and Mr. Ramesh Kumar from IDF also joined Dr. AP Jayaram during both the sessions to inculcate scientific temper in students. 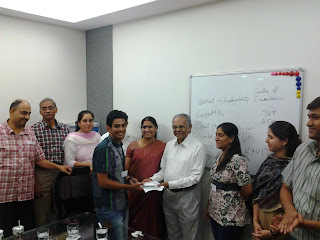 Students came up with many questions and doubts which Dr. A. P. Jayaraman answered to the satisfaction of the students. 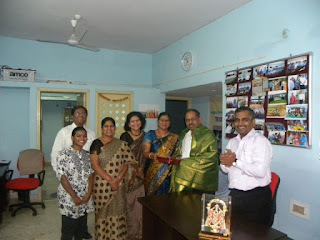 IDF Social Ambassadors - Mrs.Hema Rao Nandivelugu and Mrs. Chetna Bhatia from Nalgonda visited IDF office at Hyderabad on 28-02-2013 to greet the Scientist Dr. AP Jayaramn on the National Science Day. Also joined by other social ambassadors - Mrs. Rama, Tejaswi, Manaswi, Madhulika, Monica, Anirudha, Peri Vishwambara, Sanjay Ram, Ramesh Kumar and the parents of Mr.Sanjay Ram. Dr. AP Jayaraman and Dr. Narayan Iyer appreciated the overflowing goodness of team in Andhra Pradesh in spreading smiles all around. Creating scientific temper in young minds - National Science Day. IDF team - Dr. ARK Pillai, Dr. AP Jayaraman, Rtn. 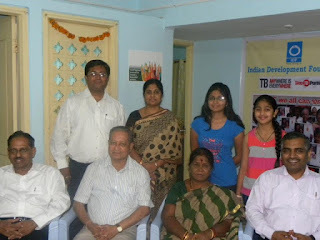 Aunali Rupani, Dr. Narayan Iyer and Mr. Nasrulla - participated in the National Science Day event organized by Mr. Anis Siddiqui from I CARE at Malwani, Mumbai on 25-02-2013. Students from various schools in Malwani took active part in the event and listened to the Nuclear Scientist Dr. AP Jayaraman and Social Scientist Dr. ARK Pillai. Asst. Commissioner of Police Mr. J.K. Hargude, Dr. Narayan Iyer and Rtn. Aunali Rupani also spoke at the event. 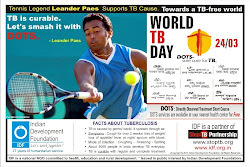 TB Awareness was also created by launching the Multi-Lingual TB Awareness Posters. Members from Andhasraddha Nirmoolan Samiti put up a skit on creating scientific temper. Olympian and India's Hockey Champion Dhanraj Pillay supports IDF's TB Cause. Launching of World TB Day 2013 Awareness Poster. 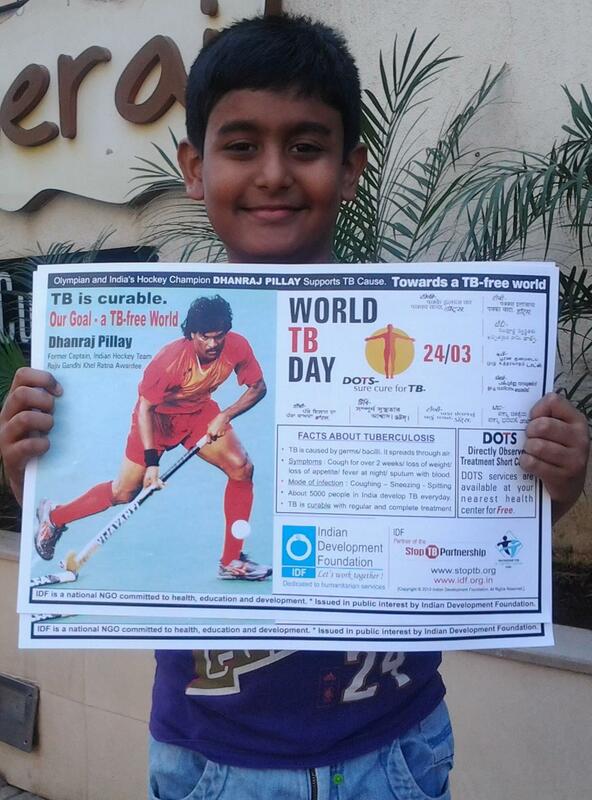 Olympian and India's Hockey Champion Dhanraj Pillay supports TB Cause. Hockey Legend has endorsed the message for a Multi-Lingual TB Awareness Poster which will be distributed across India to create a massive awareness. "TB is curable, Our Goal - a TB-free World" - Dhanraj Pillay. 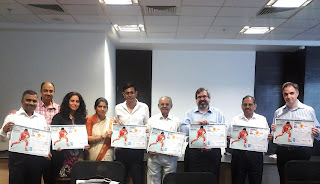 The Awareness Poster was launched by Dr.A.R.K.Pillai, Dr. A.P.Jayaraman, Mr. Rajiv Phadke, Rtn. 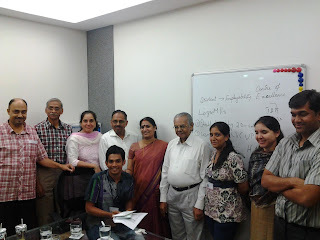 Aunali Rupani, Mrs. Rekha Bajaj, Dr. Narayan Iyer, Mrs. Neeti Sampat, Prof. Mark Nowacki and Prof. Jerome Le Dall on 24/02/2013 a month before the World TB Day which falls on 24/03. IDF young social ambassador Master Sahil Rupani along with all the social ambassadors and volunteers across India will join hands to spread the message. 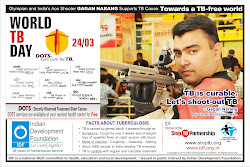 IDF had earlier got the support of Grand Master Vishwanathan Anand, Cricket Legend Anil Kumble, India's No.1 Women Boxing Champion Mary Kom, Tennis Legend Leander Paes and Olympian and India's Ace Shooter Gagan Narang supporting TB cause. 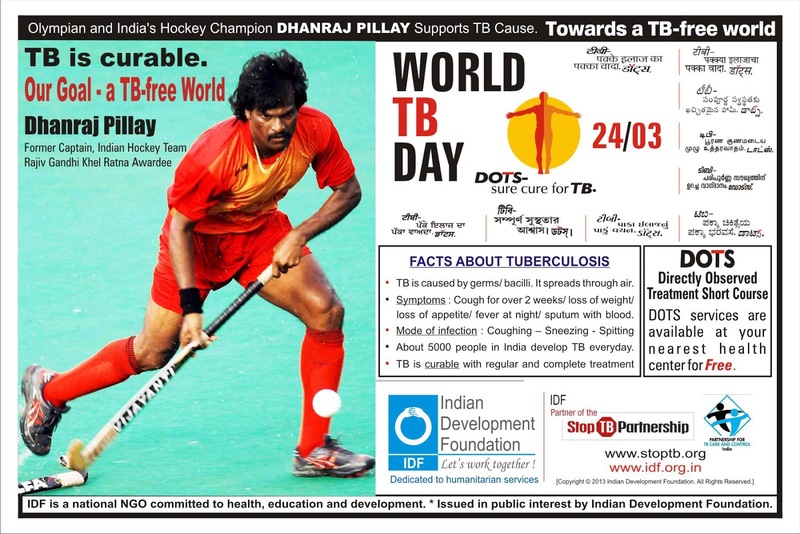 For 2013, Olympian and Hockey Legend Dhanraj Pillay has come forward to support the cause..... IDF is committed to stop TB. Dr. S. Franklin, Mr. Sanjay Ram and Mr. Ramesh Kumar from IDF spoke to the students and exhorted them to participate in social awareness projects. IDF salutes the wonderful support extended by the Principal, teachers and the students of KV No. 1, Railway Colony, Vijayawada for TB Awareness programmes. 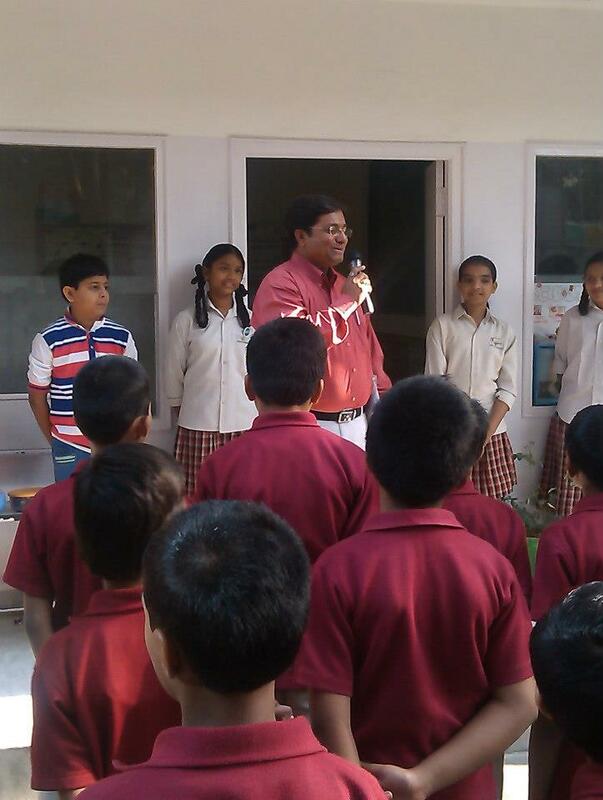 Mr. L. S. Ram Babu, Principal of the School appreciated IDF’s humanitarian work. 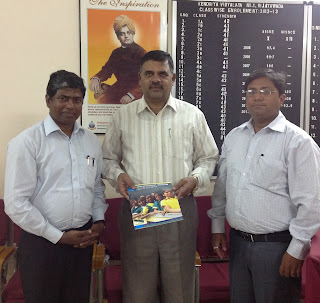 Indian Development Foundation (IDF) team – Dr. S. Franklin, Mr. Sanjay Ram and Mr. Ramesh Kumar – met Rev. 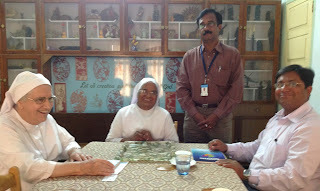 Sr. Lorenza, Administrator, Nirmala Niketan, Vijayawada, Krishna District, Andhra Pradesh on 23/02/2013. 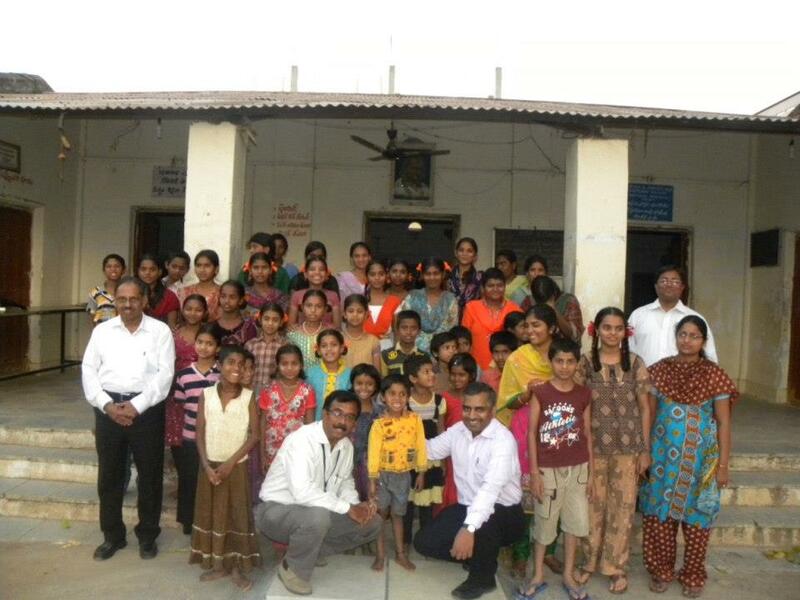 IDF salutes the Sisters of Nirmala Niketan for rendering yeoman service in the field of leprosy, TB and HIV-AIDS. IDF cherishes the long association with Nirmala Niketan and express gratitude for the wonderful support to social projects. IDF's iDiscover to inculcate scientific temper in young minds. Students of The Bombay Institution for Deaf and Mutes, Mazagaon, Mumbai got a wonderful opportunity to visit ParleG Factory on 18-02-2013. Students were first shown the AV on the production of biscuits, chocolates and wafers. They were later taken to the factory to see the real production of biscuits from the beginning to final packing. BIDM students felt extremely happy as they moved through each step experiencing the wonderful session. The event was co-ordinated by TISS social workers Anzu Augustine and Rithika Krishna. Mr. Nasrulla Adamji from IDF organize the tour to the fullest satisfaction of the visiting students. IDF conveys special thanks to ParleG Factory for the wonderful social support. IDF organizes tours for students to science centres, planetariums, industrial visits to inculcate scientific temper in young minds. The tour is organized as part of IDF's iDiscover programme conceived and supported by Capt. Shankar Bala. 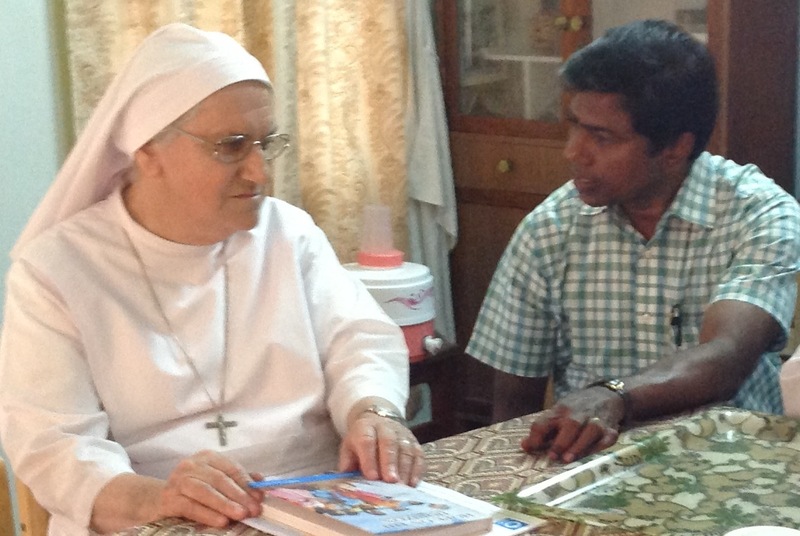 A tireless supporter of humanitarian causes, Holy Angels High School, Vijayanagar. Ms. P. Lokesh, the Principal of Holy Angels High School, Vijayanagar and his entire school team have been extending unrelenting contributions & support to humanitarian causes over the past one spiritedly supportive decade. The school has been a class apart in whatever project it undertakes. Last year the school organised a dance festival, bringing a record 2500 students on stage. Each one of the dance program had a national theme and the entire serial of 40 plus dances were witnessed by a spellbound (till the very end) crowd of 25 thousand spectators. The school had also organised a mega science exhibition on the 27th of January 2013. 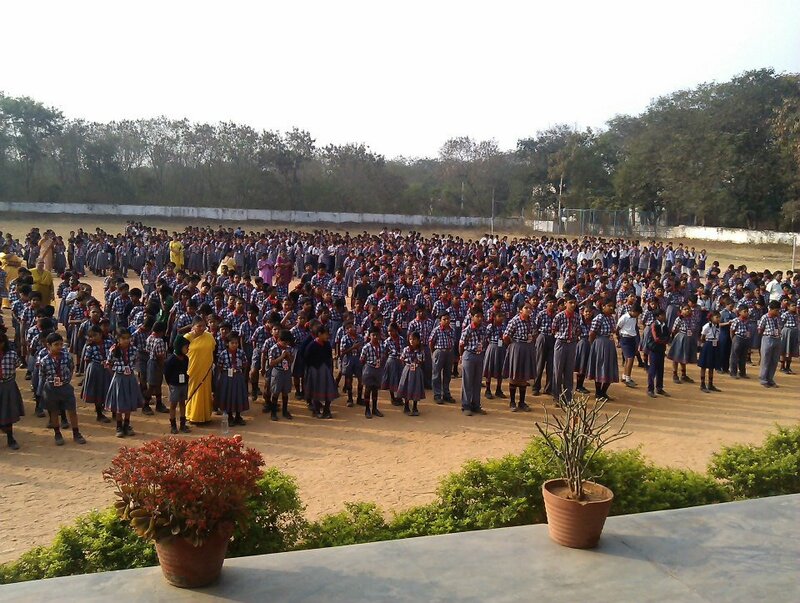 2000 students actively participated in the event and there were more than 150 stalls. Some of the stalls were excellent with quite innovative ideas and many stalls had provided working models viz Mechanism to switch off street lamps on the high ways, when there no vehicles, Generating electricity on highways using the pressure of ongoing vehicles, producing cement were some of the project. Usha Pravin Gandhi College of Management, Mumbai supports IDF's Project. Students of Usha Pravin Gandhi College of Management, Mumbai came forward to support IDF's leprosy/ TB and education projects. First, second and third year students from BMM, BMS and BSc (IT) and also students from MSc(IT) have joined hands to render their support for the humanitarian programmes. Dr. Geetha Mohan, Principal of the College appreciated the social service of her students. NSS Co-ordinators Prof.Babita and Prof. Mudassar Qureshi and Student Volunteers Anisha Crystalina Wadhwani and Dilip Vaviya took the lead to contact students, sensitize on social issues like leprosy/ TB and mobilize resource. Team IDF salutes Team UPG for the wonderful social support. Mr.Madhusudan rao donated Rs.10000/- for the trust and also informed that his institutions would take care of any child from this trust who wants to get educated in CBSE free of cost right from school to college and further give a job to that candidate in his institutions. He appreciated the role of IDF and IDF social programmes and assured that he would help in all possible ways. Mrs.Padmavathi, Child welfare committee Rangareddy district and incharge of this trust expressed her happiness in being a part of IDFand Bal Gurukul. The event was compered by Mr.Ramesh, Project manager Children of this Bal Gurukul and the nearby government school children would attend this Bal Gurukul. Ms.Saritha and Ms.Harika would be the teachers. MNR Indo English School, Kukattpally, Hyderabad receinves IDF Prizes. 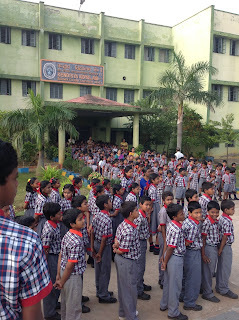 MNR Indo English School, Kukattpally, Hyderabad. supports IDF's social projects. IDF salutes MNR Indo English School, Kukattpally, Hyderabad. choolteam for extending wonderful support for health awareness, TB awareness and resource mobilization programmes. The enthusiasm of the young children, the extraordinary support by the teachers and the compassion are indeed remarkable, expressed Mr.Sanjay Ram, Project Co-ordinator, IDF. Principal of KV appreciated the humanitarian work of IDF and he was very happy to see so many of his school children coming forward to join IDF as Social Ambassadors and spread the message of goodness. IDF congratulates all the winners. Kendriya Vidyalaya No.1 Uppal School, Hyderabad receives IDF prizes. Kendriya Vidyalaya No.1 Uppal School, Hyderabad supports IDF's social projects. 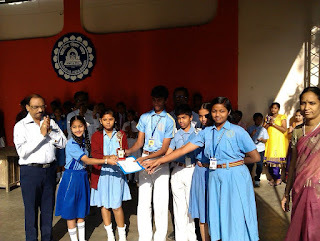 IDF salutes Kendriya Vidyalaya No.2, Uppal, Hyderabad Schoolteam for extending wonderful support for health awareness, TB awareness and resource mobilization programmes. The enthusiasm of the young children, the extraordinary support by the teachers and the compassion are indeed remarkable, expressed Mr.Sanjay Ram, Project Co-ordinator, IDF. Master Sai Lalith Reddy mobilised Rs.25000.00. Master Sai Lalith Reddy of class IV from Secunderabad Public School mobilised Rs.25000.00. The highest collection from one child from AP till date. Sai and the entire Schoolteam were awarded for their resource mobilization efforts and assistance towards promulgation of awareness. The entire schoolteam has done a wonderful job. IDF thanks the students, teachers, Principal and the school administration for their selfless service to the Society. 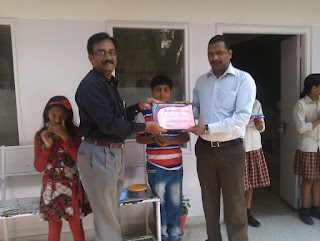 Sai and all the other students were rewarded for their efforts. On the occasion of prize distribution Mr.G.Satyapal Reddy, father- Sai Reddy was also present. 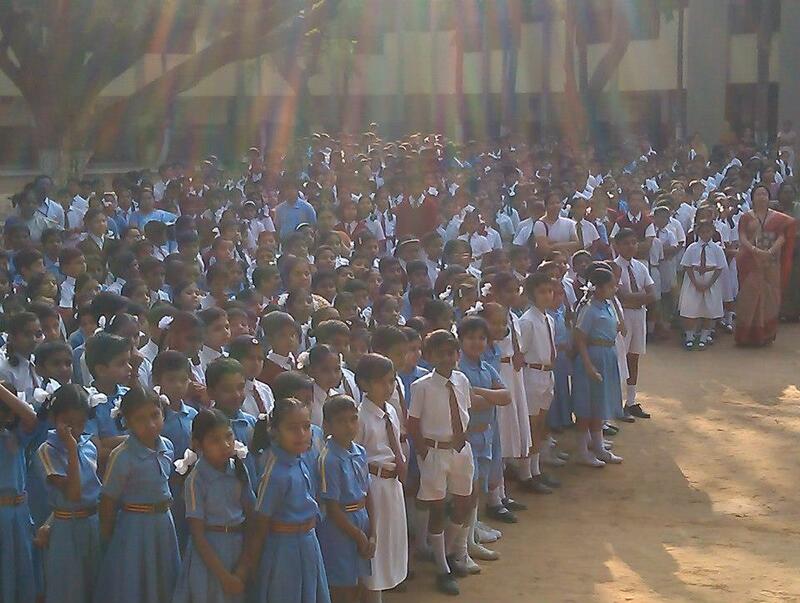 IDF appreciates Secunderabad Public School for inculcating 'Joy of giving" among their students. Anti Leprosy Week- IDF Organized an Event in Salem. Several Dignataries from various fields and IDF were present. 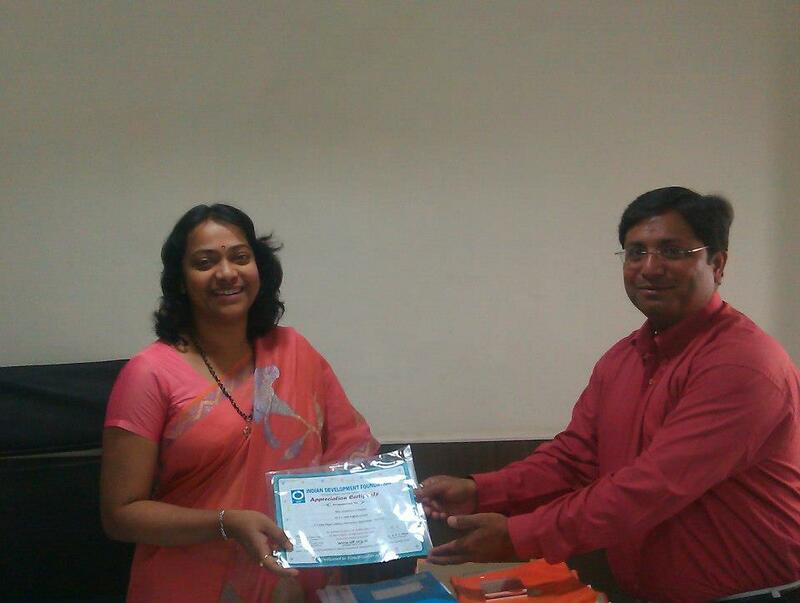 Mr. Sanjay Ramm, Project Co ordinator organized the event with his Team. 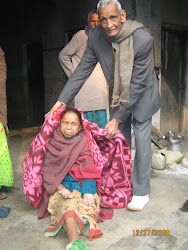 People were treated for their minor problems and Special preventive advice were given to them. granted with Walking aides; Gifts were distributed by the guests among the patients. 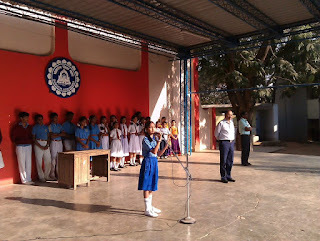 IDF Young Ambassador Ms.Manaswi spreading TB Awareness. 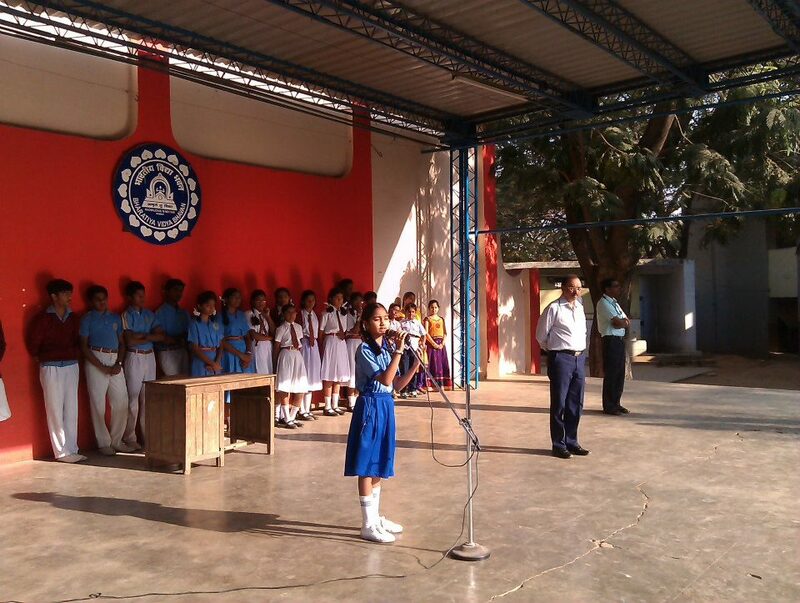 IDF Young Ambassador Ms. Manaswi spreads TB awareness among students of Bharatiya Vidya Bhavan Public School, BHEL, RC Puram & Hyderabad. All the students were enlightened about TB and all were motivated to spread the Goodness Message to their friends and family. The students and the attendees were quite impressed by the awareness program compered by IDF Young Ambassador Ms. Manaswi and they believed that they have a duty to reach-out to the people with TB awareness programs. The entire staff of the school extended all possible support and promised to do their best in making the social program a grand success. Indian Development Foundation congratulates Ms. Mansawi for her wonderful work towards creating awareness and helping in creating an alert and proactive India. 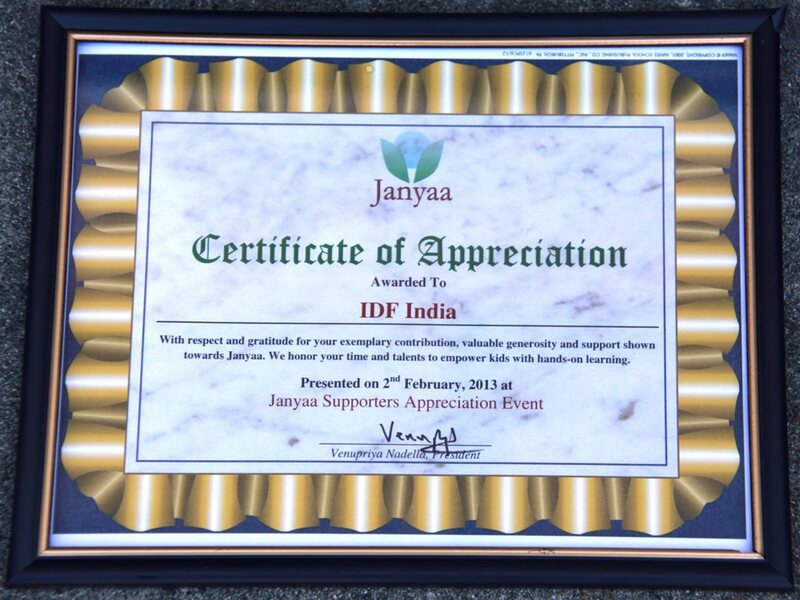 Janyaa Appreciation Award to IDF. 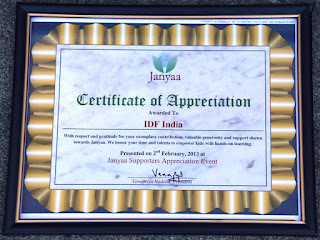 Janyaa appreciates IDF for promoting scientific temper, 2nd Feb 2013- SanJose, USA. IDF partners with Janyaa to promote scientific temper in young minds by providing science experiments and games to schools. Through IDF's support, 50 schools in Mumbai could get benefit of the science experiment kits for class VI and VII students. 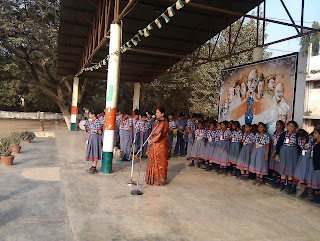 IDF in association with Janyaa conducted the event Schools of Malvani, Mumbai in the month of Dec 2012. Teachers participating in the workshop were happy to receive a practicle training where they were demonstrated with the experiments which made the learning more easier and scientific for the students. 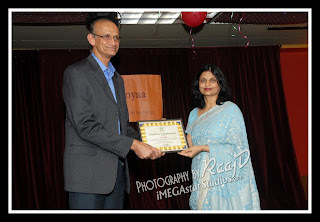 Mr. S. Jayaraman,Trustee,IDF-USA received the certificate, SanJose, USA. Rotary International District 3140 presented LifeTime Achievement Award to Dr. ARK Pillai, President, Indian Development Foundation (Formerly Indian Leprosy Foundation) for outstanding contributions in the field of leprosy eradication in India. 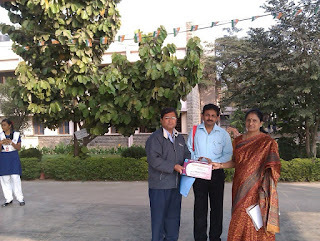 The Award was presented at the RI District Conference held at Aamby Valley City, Pune on 2nd Feb. 2013. 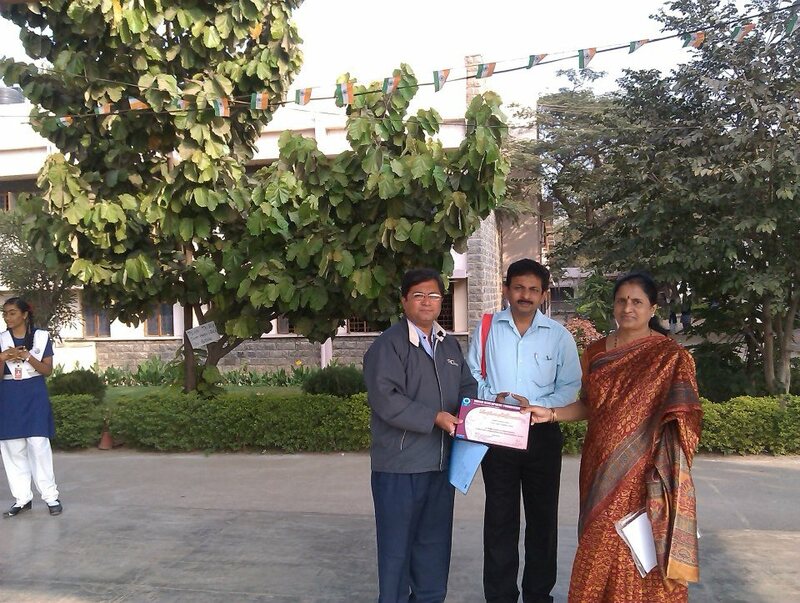 The Award was presented by District Governor Dr. Bal Inamdar and R.I. Representative Terry Titus (Dt.7690). Dr. Pillai dedicates the award to his fellow-workers, leprosy-cured persons and their familes, students in India and all supporter for extending a helping hand for the noble cause.